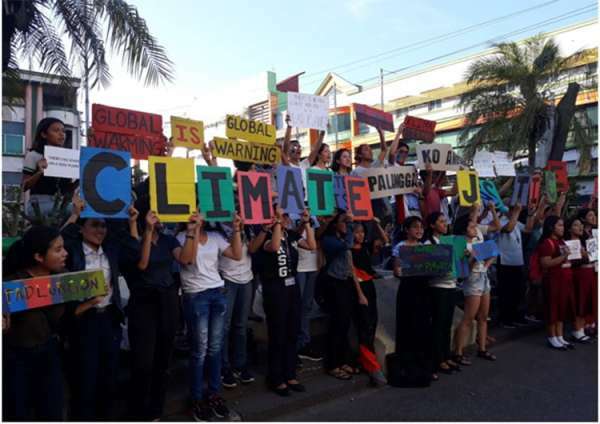 THE Negrosanon youth joined thousands worldwide as they rallied for climate justice Tuesday, March 19, at the Fountain of Justice in Bacolod City. Two youth organizations, Linghod and Youth for Climate Hope (Y4CH), called for the need to curb carbon emissions to limit global warming to 1.5 degrees Celsius. "We are participating in the international call for climate justice and our participation because we want to create a big impact," said Krishna Ariola, lead convenor of Y4CH. "We are amplifying the call for climate justice because in developing countries, we are the ones suffering from all of these impacts," Ariola added. The protests were held as part of the Global Youth Strike for Climate, a movement composed of students who are skipping classes and are marching instead on the streets to demand urgent climate action from their governments. The groups led a massive protest last March 6 outside the provincial Capitol. On that same day, Governor Alfredo Marañon declared Negros Occidental coal-free through an executive order. The move was considered a momentous victory for the province. Ariola said their groups will now conduct a more pro-active campaign for an ordinance to be passed by the Provincial Government, focusing on renewable energy growth. "We are not just blaming the system or calling out the government, but we also want to be a part of nation-building, of starting the RE campaign in Negros Occidental," she added. San Carlos Bishop Gerry Alminaza also joined the demonstration, remarking he was proud of and inspired by the actions of these Negrosanon youth for taking responsibility for their future. "It's about time to act. There's no time to dilly-dally because later is too late. So I hope our leaders will really act on the problem of climate justice now. They don't need any more data to act on this. So please listen to our young people," he said. San Carlos City is the site of a proposed 300-MW coal-fired power plant by SMC Global Power. Alminaza said that while the facility will be "able to conform to the conditions set by the government," it will still contribute to climate change. "We already know for a fact there is no such thing as clean coal. I hope that the businessmen and women behind the coal-fired power plant of San Carlos City will relent and instead invest in RE," he said. With the midterm elections coming up, Linghod and Y4CH plan to work with other groups in organizing local forums to raise awareness on environmental issues. "We are hoping to drum up environmental concerns in their political platforms because we want to highlight their importance," Ariola said.